Review posted December 1, 2018. Little Bee Books (Bonnier Publishing), New York, 2017. 36 pages. 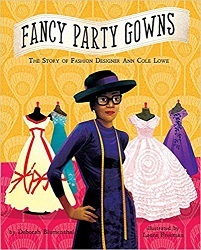 I’m not terribly interested in fashion design, so I was surprised by how much I enjoyed this picture book biography of fashion designer Ann Lowe, the first African American woman to become a designer of couture clothing. The illustrations are colorful and striking. The pictures of Ann Lowe’s famous gowns, such as Jacqueline Kennedy’s wedding dress, are beautiful. Ann also knew that doing what you love could set your spirit soaring. Ann thought about what she could do, not what she couldn’t change. When Ann saw obstacles, she thought about what she could do, not what she couldn’t change. Ann bought fifty yards of the finest ivory silk taffeta and the trimmings to go with it. For months, she cut and sewed. The gown had a wide bouffant skirt with pleated bands and tiny wax flowers. Ann also made all the dresses for the wedding party. Then just ten days before the wedding, Ann opened the door to her workroom. A pipe had burst. Water gushed everywhere, flooding everything! Ten of the sixteen gowns were destroyed. She bought more fabric and trim, and hired others to help. She lost money instead of earning it. In just eight days and eight nights, Ann and her team remade all the dresses. That wedding was also where Ann was told to use the back entrance to deliver the dresses – but she stood her ground and said those dresses wouldn’t be in the wedding unless she was allowed to enter through the front door. This is a lovely book about overcoming obstacles and doing what makes your heart soar. If you are interested in fashion design, all the better!